At Liquid Floors, making your floors functionally stunning is everything to us. If you are ready to revolutionize your floors with the finest epoxy materials and workmanship, so are we. Protect your flooring, make it look great and make it function at the highest level with Epoxy and LiquidFloors. Epoxy is a surface coating that protects concrete flooring from the day-to-day wear and tear that can degrade concrete over time. Epoxy floor coating is a stain-resistant, chemical-resistant, durable floor coating that provides luster and even beauty to many industrial settings. Why Liquid Floors Epoxy Flooring? The benefits of epoxy coatings are numerous and varied, making epoxy flooring a preferred option for many businesses. Here are a few of the reasons our Epoxy Floors will provide your facility maximum benefit! 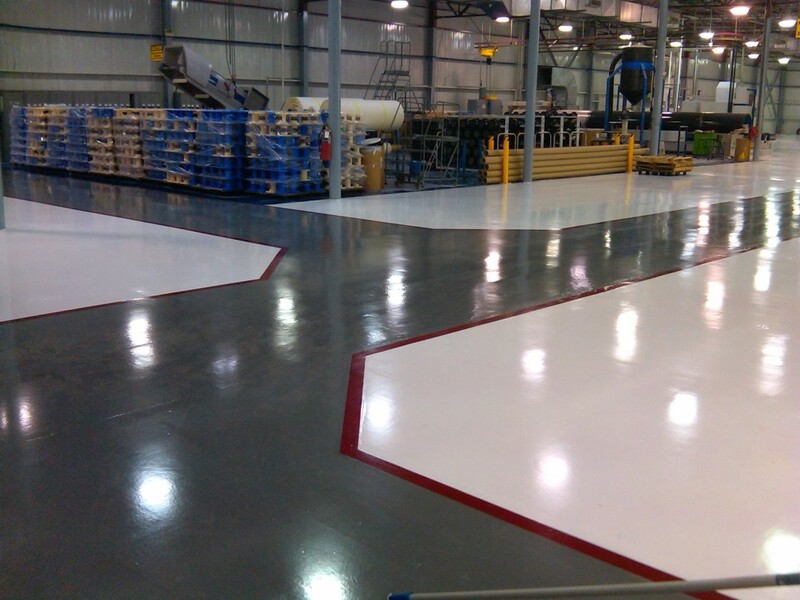 For more information about how epoxy coating can benefit your business, or for a free quote, contact Liquid Floors. We deliver the very best in quality to businesses and agencies seeking durable flooring options. Epoxy coatings offer inexpensive and durable protection for concrete floors, lasting for many years and reducing maintenance costs over time. Businesses with epoxy coatings often spend less money on flooring over time. Epoxy floorings can be formulated to deliver chemical resistance to specific types of chemicals, for businesses requiring this type of chemical resistance for the safety of their workers. With anti-skid, impact resistant and fire resistant options available, epoxy flooring is safe for a variety of industries. This can improve productivity while reducing incidents and near misses at the work site. Designate specific work zones within a single building using different colors of epoxy flooring for this purpose, indicating which areas are used for storage, vehicle parking, foot traffic and more. Epoxy coating is highly resistant to damage from long-term use, setting up your flooring and work environment for long-term success. With different colors and patterning flecks available, epoxy coating is an asset in show rooms and stores where product display is critical to the success of the business. Epoxy flooring is a product that is installed over concrete. The installation process begins with flooring contractors preparing the area to be coated. The floor is mechanically prepared by shotblasting or diamond grinding , ensuring that the epoxy will properly bond to the concrete. The epoxy is made of resins mixed with a hardener. The two parts are mixed together and then applied to the surface of the floor. For maximum wear protection a urethane is applied over the epoxy. When this process is complete and the epoxy has cured, the resulting product is a reflective, long-lasting, super hard surface, perfect for industrial manufacturing plants, warehouses, construction companies, stores and other commercial settings. It is impact resistant, heat resistant and capable of bearing heavy weights without cracking or flaking. LET’S TALK ABOUT YOUR FLOORS!